Honolulu, HI – Two child care providers are celebrating a unique and prestigious honor: Helen McComber and Pegeen Echavaria are the first two home-based child care providers in Hawai‘i to achieve national accreditation. The Department of Human Services (DHS) and Windward Community College’s Learning to Grow Project come together to provide funding and technical assistance so that providers like McComber and Echavaria can achieve accreditation from the National Association for Family Child Care (NAFCC). Pegeen Echavaria, a family child care providerm interacts with children at her Learn, Play, Pray Daycare. “Our vision is for Hawai‘i residents to thrive. The success of our keiki ages 0 to 5 is integral to their future and the well-being of their families. Ensuring children have access to safe, quality early childhood learning opportunities translates into better outcomes for kids and their families for years down the line,” said Department of Human Services Director Pankaj Bhanot. NAFCC sponsors the only nationally recognized accreditation system designed specifically for family child care providers. Accreditation is awarded to family child care providers who meet the requirements and quality standards in five main content areas: focusing on relationships, the environment, developmental learning activities, health and safety, and professional business practices. McComber (Nā Pua Learning Academy) and Echavaria (Learn, Play, Pray Daycare) worked with Windward Community College’s Learning to Grow Project and their NAFCC Accreditation Facilitation Project to earn this prestigious accreditation. The Learning to Grow Project, which is funded by DHS, supports providers to increase their capacity and quality with monthly training sessions, home visits, observations, and one-to-one coaching sessions as they move toward accreditation. “This national accreditation award presented to Helen and Pegeen honors the hard work and dedication that they promote and execute on a daily basis to provide a safe, healthy, and nurturing environment for the young children in their home care programs. We are so proud of them!” said Mary Ann Nemoto, Learning to Grow’s project administrator. 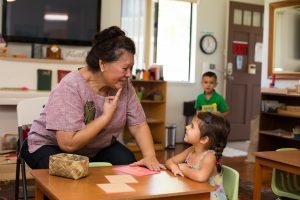 Collaboration between Learning to Grow, the State of Hawai‘i DHS, and child care providers pays dividends for families. With more accredited providers, parents in Hawai‘i will have more opportunities to expose their children to high quality early learning experiences. Helen McComber puts her training and experience to good use at her Nā Pua Learning Academy. “Being a parent myself, I understood that mākua (parents) truly want the best for their keiki in all aspects of their lives, especially education. To meet this need I worked to obtain accreditation demonstrating my commitment to students, their families, and the level of education provided at Nā Pua Learning Academy. As families trust their keiki’s most fundamental years of learning and growth, we have a kuleana, both a responsibility and privilege, to provide the best education possible which is demonstrated through accreditation,” McComber says. Currently, there are 349 DHS-registered family child care providers in Hawai‘i. Registered family child care is defined as a single person, providing child care in his or her own home, for no more than six children at any given time.